Cigarette fortunes act as commentary on cigarette packaging propaganda. Text from fortune cookies is reproduced on the seam of individual cigarettes, subtly configured in the shape of a coffin. The content of the fortunes, appropriated from actual fortune cookies, progresses from somewhat neutral or optimistic text to text which foreshadows the potentially damaging effects of tobacco use. 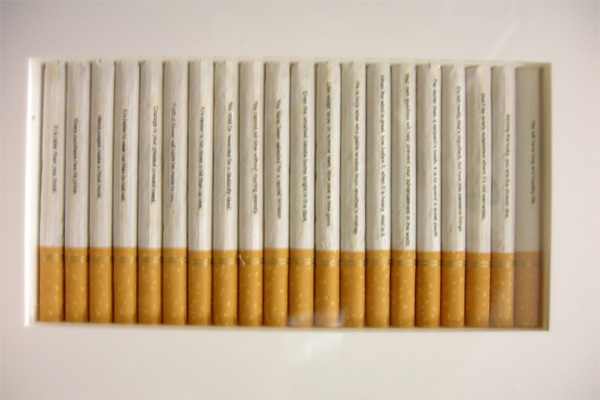 The cigarettes are displayed in a white laser-cut plexiglas® frame, within a transparent protective case.